the signs they co-occur with. They can spread over adjacent signs to combine and group multiple signs under one mouthing, or they can occur in the sign stream without an accompanying sign, fulfilling a role that could have been taken by a manual sign as well. 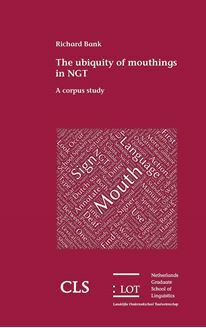 The general conclusion is that mouthings are a paramount feature in NGT conversation, and that they can be analysed as instances of code-blending, the simultaneous mixing of languages in different modalities. Understanding the role of the mouth offers substantial new insights in the cross-modal interaction between two languages.